It should surprise no honest human being that New Zealand, along with Australia, Canada, and the United Kingdom, is a part of history’s first “global” empire. This “Atlanticist” English-speaking empire first partially established itself after the defeat of Napoleon, and then cemented itself more firmly after the First and Second World Wars. It is headed by the United States, of course, but includes the United Kingdom in a grandfathered “special relationship” that increasingly resembles the role a ventriloquist’s dummy plays in a cringe-worthy comedy routine. The United Kingdom’s former colony, New Zealand, thus, cannot honestly be described as a sovereign, independent, nation-state, however much its citizens would like to believe this to be the case. Rather, this small nation of fewer than five million souls continues very much as in the past, an extremely junior – and therefore even more extremely disposable – sidekick who is good for a little public relations coup now and again but otherwise of small importance. Before Kiwi readers throw up their hands in disgust, let it be argued that the good citizens of Aotearoa New Zealand should be glad of this status. It gives them the opportunity to strike out for actual statehood. The imperial core may chafe and lash out, but the stakes are so low it will likely allow full independence in the end. The immediate obstacle remains New Zealand itself. Its elites, especially in the National Party (an ironic misnomer if ever there was one), identify completely with the Atlanticist Empire. This is proven by the career path of its globalist Prime Minister, who cut his teeth as a servile hatchet-man for The City of London and whose most expensive residential property cuts a fine sky-line in Hawaii, USA. Fortunately for New Zealand national independence, Prime Minister John Key has decided to resign his position. This surprise move ultimately stems from the Atlanticist imperial defeats in Syria, Libya, Ukraine, and the reversals to globalism in Britain, the EU, and the United States itself. Sending Kiwi troops to Iraq over a year ago could even land Key in the dock at The Hague someday. He has certainly breeched a fistful of United Nations binding resolutions, and may have directly contravened New Zealand statute law by sending New Zealand forces to support terrorism in the Middle East. In 2015, Key dispatched New Zealand armed forces to Camp Taji, Iraq, a former US base and prison north of Baghdad. There soldiers train the Iraqi 16th Mountain Division, whose area of operation lies northward from Taji to the Turkish border. It just so happens that this Kurdish region is known for the theft of oil belonging to the nation of Iraq and the sale of this illegal commodity to Turkey, whose ruling clique uses it to launder ISIS-pirated oil from both Iraq and Syria. Thus, the now running-for-cover, Key involved Kiwi armed forces in the furtherance of ISIS funding, arms and explosives purchases, and terror attacks (including those in Paris, Egypt, Mali, and elsewhere). Proof that the 16th Mountain Division is involved in this oil-running lies in the assassination of its commander outside his home in July, 2015 (i.e., it is embroiled in a turf war over protection rights among Iraqi army units). Proof that the former Prime Minister knows this lies in the very recent Official Information Act lawsuit by Minister Ron Mark which reveals that New Zealand’s armed forces are conducting absolutely no “after action” analyses on how the 16th Mountain Division has used its Kiwi training. Turkey’s involvement in supporting ISIS has been an utterly open secret for many, many years. Surely the New Zealand Security Intelligence Service briefed the Prime Minister. The mainstream press has been briefing the public on the issue since before 2013. As former US intelligence officer G. Murphy Donovan writes, Turkish support for ISIS is “the worst kept secret in Mesopotamia”. Turkey receives more US foreign aid than any other nation, apart from Israel and Egypt. This number-one son seeks and receives permission for absolutely everything it does, including its laundering/brokering of ISIS oil and oil sales, and the shootdown of the Russian Federation’s Su-24 bomber on November 24, 2015. Its security services also provide ISIS with weapons and domestically manufactured explosive compounds. Most recently, its military has invaded both Syria and Iraq in exactly those areas traversed by illegal oil and arms convoys. And yet, the United States stoutly refuses to censure its tool, for reasons that should by now be pretty obvious – ISIS is an “Operation Gladio”-style manufactured enemy upon whom interventions may be blamed, because of whose existence popular sovereignty, political liberty, and political equality may be restricted, and by whom, lastly, false flag attacks may be conducted. ISIS resembles the Contras of the 1980s or UNITA of the 1970s. The phenomena is, at its core, a mere intensification of the Al Qaeda model, which has served US imperialism so well since 1980. As former Reagan Administration official, Dr. Paul Craig Roberts, states in a recent article, “Washington is not opposed to terrorism. Washington has been purposely creating terrorism for many years. Terrorism is a weapon that Washington intends to use to destabilize Russia and China by exporting it to the Muslim populations” of those countries. The ultimate aim remains Atlanticist global hegemony and the looting of those two nations in order to repay twenty trillion dollars of government debt, sixty-four trillion dollars of overall debt, and six-hundred and fifty trillion dollars of derivative overhang. This being the case, New Zealand involvement in Operation Inherent Resolve amounts to criminal participation in aggression, theft on a global scale, and wholesale – as opposed to retail – terrorism. The United Nations has passed many resolutions on these issues: for example, it declares all “direct or indirect” support for ISIS oil smuggling to be a breach of international law. New Zealand statute law clearly prohibits all contravention of UN resolutions, whatever their nature, so its wilful entrance into the ongoing violence in the Middle East, organised by the United States, the EU and NATO, is a crime of aggression. 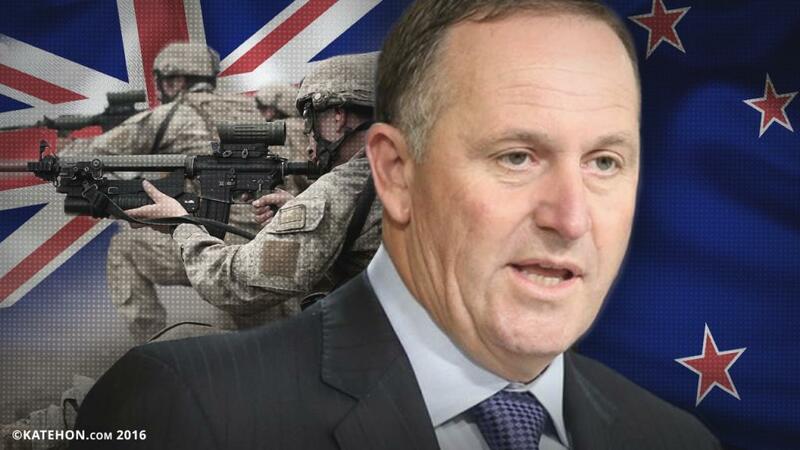 Former Prime Minister John Key, as then commander-in-chief, has ordered New Zealand armed forces to train and assist Iraqi military units who are culpably engaged in indirect support of ISIS. New Zealand troops, therefore, indirectly support ISIS. This is expressly sanctioned by the United Nations and is a violation of international law. And it must be stressed that this was done with full knowledge. The Prime Minister cannot claim he did know that Turkey laundered ISIS oil with oil smuggled through the operational zone north of Camp Taji. Everyone in Iraq knows this. The Russian Federation has filmed the immense, and impossible not to notice, scale of the theft. Footage shows at length oil heading for processing in Batman, Turkey, just across the border from Mosul. With full knowledge but little concern, John Key has committed acts expressly prohibited by New Zealand statute law and is pretty clearly subject to prosecution. This is the most likely reason for the banker-turned-politician to have resigned. Now that John Key has removed himself from the office he has hesitated not one second to sell to Atlanticist hegemony, perhaps the citizens of Aotearoa New Zealand can see to it that their country becomes an actual independent nation-state with full sovereignty, complete with its own foreign policy (based on positive and respectful interaction with all nations, rather than blind and cringing obedience to the global torture-master). No honest human being could object.